Many Ranch Horse enthusiasts continue to show past the age of 18 but are not equine professionals. The American Ranch Horse Association Amateur Division was created to encourage and promote the general interest of the Amateur. Eligibility requirements must be met yearly to obtain and maintain Amateur status. Leadership opportunities are also available to Amateurs. Our Amateur Committee was created in 2012 and will meet annually to discuss improvements to the Amateur program. 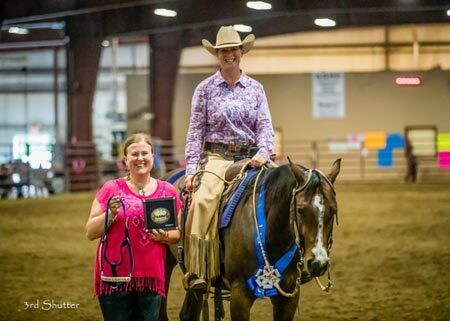 ARHA Amateurs competing in ARHA approved shows earn points that allow recognition of the Amateur with awards like Register of Merit, Champion, Ranch Horse Champion, Superior Event Horse, Super Ranch Horse, Performance Versatility Award. Each year, Amateurs and their Ranch Horses compete against their peers for national awards like Ranch Horse of the Year, Top 5, Regional High Point, and overall High Point. The Novice Amateur Program is open to any ARHA member who possess a current ARHA Amateur card and meets all Novice Amateur criteria. An Amateur card with a Novice notation will be issued to each person who supplies ARHA with a signed Eligibility Statement. Points in the Novice Program do not count toward any ARHA awards. A Novice Amateur High Point Award will be awarded to the National High Point Novice Amateur. There will be no ROM’s presented in Novice Amateur classes. This designation is offered to encourage exhibitors who have shown and been successful in riding events, to also enter ARHA cattle classes. The American Ranch Horse Association remains committed to developing horses and exhibitors that are confident in all aspects of an all-around program that includes cattle classes. The ARHA recognizes that exhibitors new to the association may have strong competencies in areas such as horsemanship, trail, reining, and ranch riding yet have never shown in the cattle events. This designation as a novice in “Cattle Only” will allow these exhibitors, and seasoned ARHA exhibitors who have not tried the cattle classes, to compete with others who are also new to these events. - Amateur exhibitors who do not qualify for the novice program may request Novice Cattle Only eligibility. Novice Cattle eligibility is reserved for Amateur exhibitors. An Application/Renewal for the ARHA Novice Amateur Cattle Only designation must be submitted each year of potential eligibility. Falsifying the Novice Cattle Only application will result in disciplinary action by the association. ARHA reserves the right to verify information provided by an applicant and to refuse eligibility as a Novice Cattle Only exhibitor. This determination will be provided to the applicant in writing. Weekend high point awards may be paid to Amateurs. ARHA Amateur members may accept class payback and cash high point awards without jeopardizing ARHA Amateur status. ARHA encourages members to check with any other organizations for clarification on how this rule affects Amateur status in that organization.